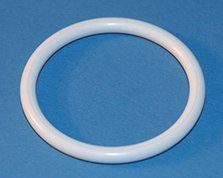 Polytetrafluoroethylene (PTFE) O-rings are widely used for chemical applications due to their wide temperature operating range, as well as low moisture absorption properties. These O-rings are hydrophobic, which don’t get wet when they come in contact with water. The operating temperature range is -300 oF to 500 oF. These O-rings are provided in white color. The O-rings are phthalate free and X-ray detectable. Excellent resistance against brake fluids, hydraulic fluids, ketones, ozone, petroleum oils, silicone fluids, transmission fluids, and water. Good resistance against dilute acids, dilute alkalis, steam, and strong acids. Due to low friction characteristics, PTFE O-rings meet USDA, FDA, and 3-A dairy requirements. Hence, these O-rings are perfect for several food and beverage processing applications.